Porsche’s GTS models have traditionally improved significantly with each new model released; the new 911 GTS range is no exception. 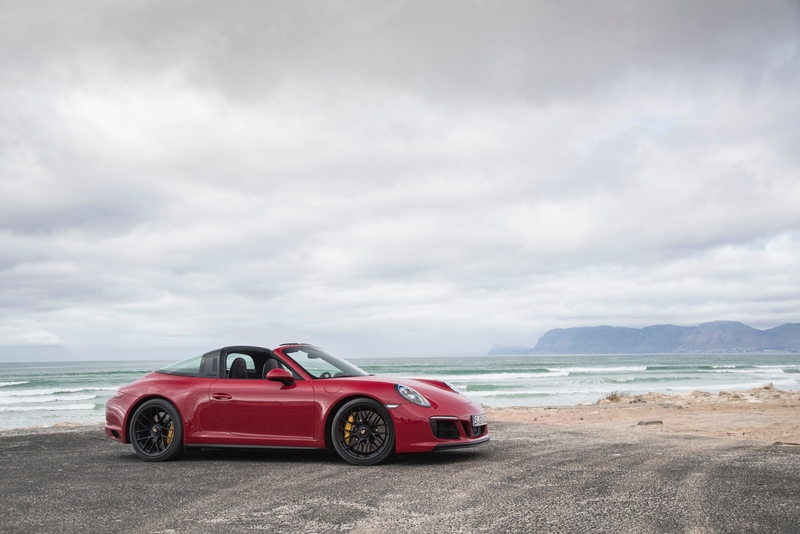 On offer are five variants of the iconic vehicle: the 911 Carrera GTS (rear-wheel-drive), the 911 Carrera 4 GTS (all-wheel-drive); both available as a Coupé or Cabriolet, and the 911 Targa 4 GTS. These new models are easily the most emotional, sporting and engaging to come out of Porsches factory in recent history; they are built with the driver in mind. All models are powered by a 331kW (450hp) bi-turbocharged 3.0-litre flat-six engine pushing out 550Nm of torque between 2250-5000 rpm. 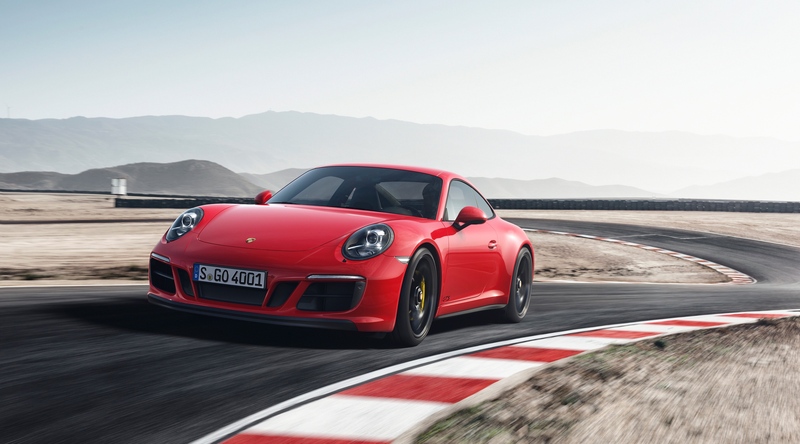 The newly developed turbochargers and increased boost pressure add an additional 22kW (30hp) to the existing power in current 911 Carrera S models (and 15kW/20hp compared to previous naturally-aspirated GTS models), whilst improving acceleration and top speed at the same time. To help you smash through all that power is a seven-speed manual transmission with the option of a Porsche Doppelkupplung (PDK) gearbox. Boasting a 0-100km/h sprint of just 3.6 seconds, the new 911 Carrera 4 GTS is more than capable when embellished with Porsche Doppelkupplung (PDK) and Sport Chrono Package (standard on all models) and Sport-Plus mode engaged; shaving 0.2 seconds off current S-Model speeds. As for the rear-wheel-drive 911 Carrera GTS Coupé: with a manual transmission it will blast all the way up to a top speed of 312km/h. Not only are they quicker and more responsive, but the new models are also more fuel efficient than past models by up to 0.6L/100km. 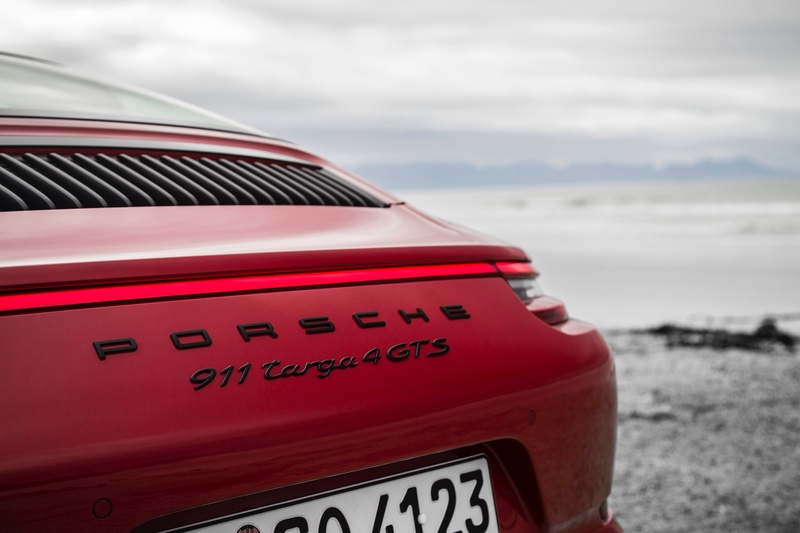 For example: the 911 Carrera GTS with PDK consumes 8.3L/100km with a CO2 emission rating of 188g/km, despite its high performance engineering. As if all these improvements weren’t enough, Porsche decided to considerably improve cornering dynamics as well; their 911 Carrera GTS (on standard road tyres) blasting through the 20.83-kilometre Nürburgring Nordschleife’s 73 corners in just 7:26 minutes. This boasts an improvement of twelve seconds over previous GTS models and four seconds faster than the current 911 Carrera S. Should you wish to, Porsche has road-approved Ultra High Performance (UHP) sport tyres available for all current 911 models from Porsche Centres. These UHP tyres’ compound, profile and profile depth are specifically made with racing circuits in mind; they also happened to improve the aforementioned Nürburgring lap time by a whole four seconds. Whilst models housing a manual transmission use a more traditional (however still highly capable) mechanical rear differential lock, GTS models with the PDK transmission option will benefit from Porsche Torque Vectoring Plus (PTV+) in addition to an electronically controlled differential lock. While differential locks are no new thing, the systems fitted to Porsche’s new GTS range are re-engineered to perform to the absolute limit; they also feature targeted braking which intervenes and adjusts the independent braking to the inner wheel when under high-speed cornering. All of this horsepower sits atop a sports chassis with Porsche Active Suspension Management (PASM). 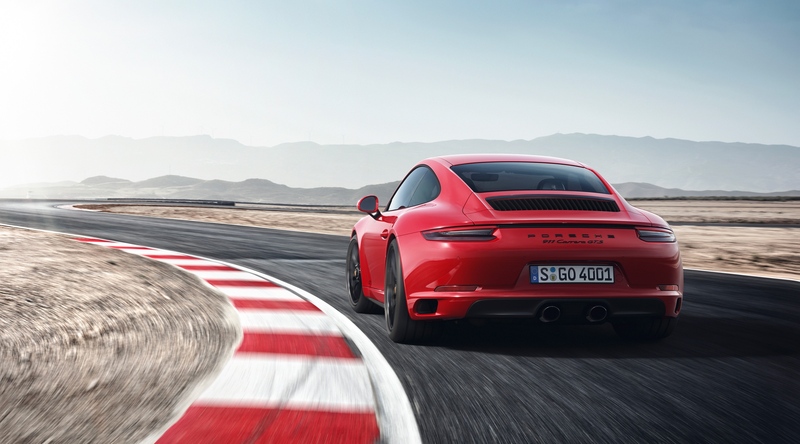 Thanks to the PASM, coupé bodies are lowered by ten millimeters compared to the 911 Carrera S, whilst the Carrera 4’s wider body gives each GTS model a 44mm broader track width at the rear axle. Through this broadened track, lateral body movement is greatly reduced and cornering stabilizes considerably, giving the GTS a largely unmatched agility on the track. 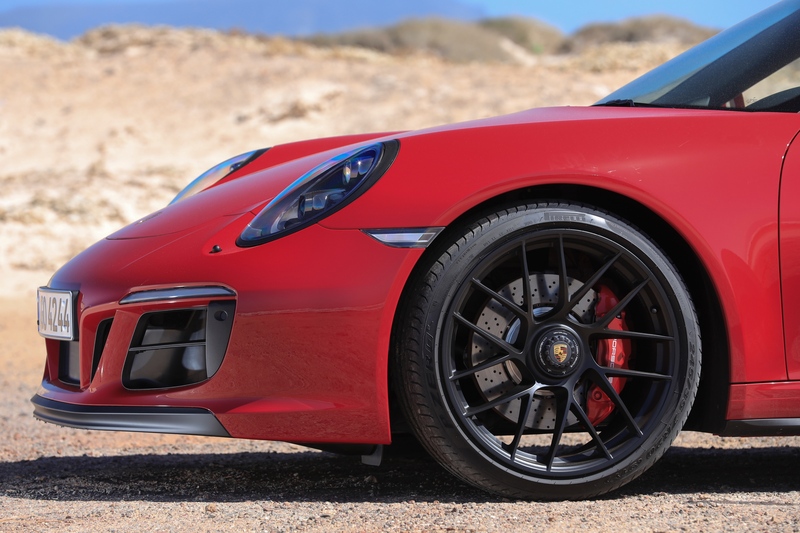 Standard equipment on all GTS models also includes 20-inch centre lock wheels finished in silky-black with red brake calipers, while buyers have the option of adding rear-axle steering to improve steering and stability at high speeds, if they wish. This rear-axle steering system effectively shortens the wheel-base without all the welding and mess: when travelling at speeds up to 50km/h, the rear wheels are steered in the opposite direction to the front wheels, causing the cars pivoting and turning circle to be reduced significantly. When travelling at speeds above 80km/h, the all the wheels are steered in the same direction: this basically increases the “wheelbase” for added stability (in situations such high-speed lane changes this can be extremely beneficial). Those centre-lock wheels hide a delicious little improvement to all but the prying eye: a completely redesigned brake setup including 16 per cent bigger pads than the 911 Turbo, and discs that are ten millimetres larger in diameter with optimized ventilation. This reimagined ventilation and brute strength means that deceleration in unprecedented in the GTS range; pulling the vehicle up firmly and efficiently, even under considerable thermal load around a track. This fresh setup is bolted to a lightweight aluminium hub to reduce unsprung weight even further, consequently adding to the overall responsiveness of the vehicle. With numerous modes available when driving, the GTS models become and endless adventure, testing your capabilities as a driver, all the while. 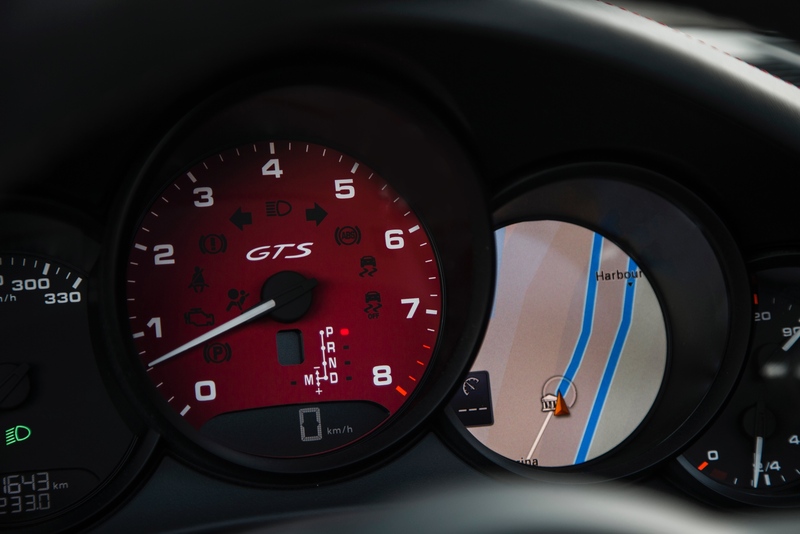 With the Sport Chrono Package standard on new GTS models, a mode button is conveniently located on the steering wheel, allowing quick transitions between modes depending on your mood. Sport mode brings with it shorter shifting times and optimum shifting points which allow maximum acceleration without delay, however when Sport-Plus mode is engaged: these characteristics flourish even more, with maximum performance the main objective. Launch Control is available for racing starts in addition to activating the Sport-Response button, which prepares the engine and gearbox to unleash power in the fastest possible sequence with absolute precision. 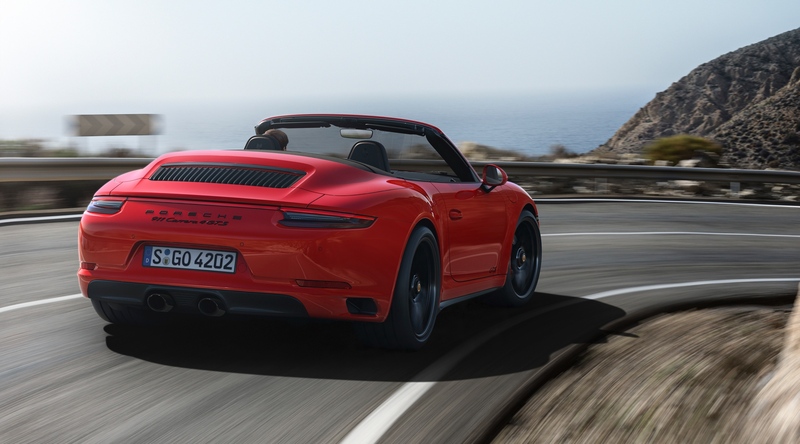 The new GTS models have had their aerodynamics and aesthetics completely rejuvenated, with all variants featuring the new SportDesign front apron; giving them a distinct appearance compared to standard Carrera and Targa models. Other GTS-only styling details include: smoked tail light lenses as well as black air-intake grille, logos & centrally-located exhaust pipes which are also finished in black. 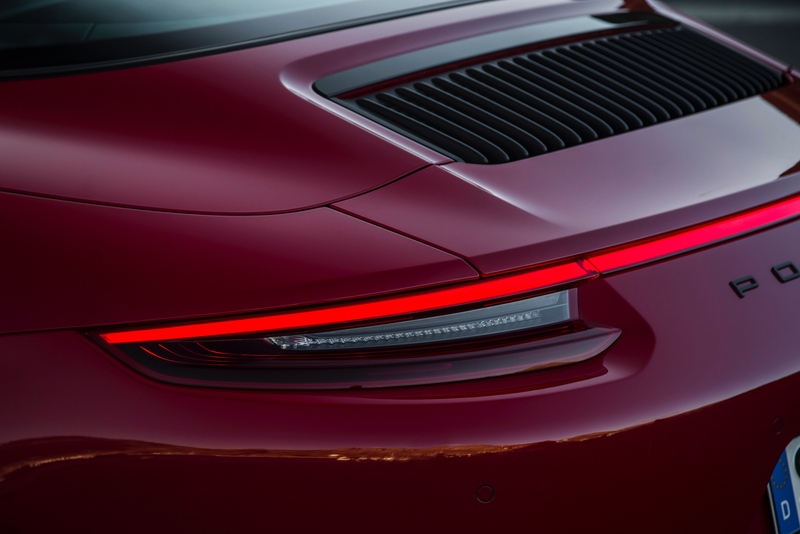 All-wheel-drive models will be set apart further, with the trim strip located between the tail lights finished in black instead of the standard light strip featured on other Carrera 4 models. The 20-inch centre lock wheels and SportDesign exterior mirrors are finished in silky black, whilst Targa 4 GTS models will include a black Targa roof bar as standard for the first time. 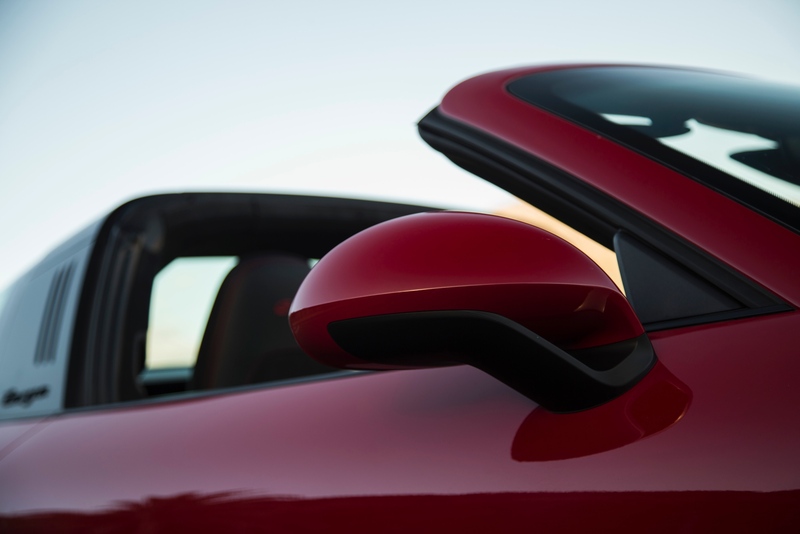 Aerodynamics are improved thanks to an optimized front end and low front spoiler, in addition to a higher rear spoiler extension; reducing lift forces on both the axles simultaneously. 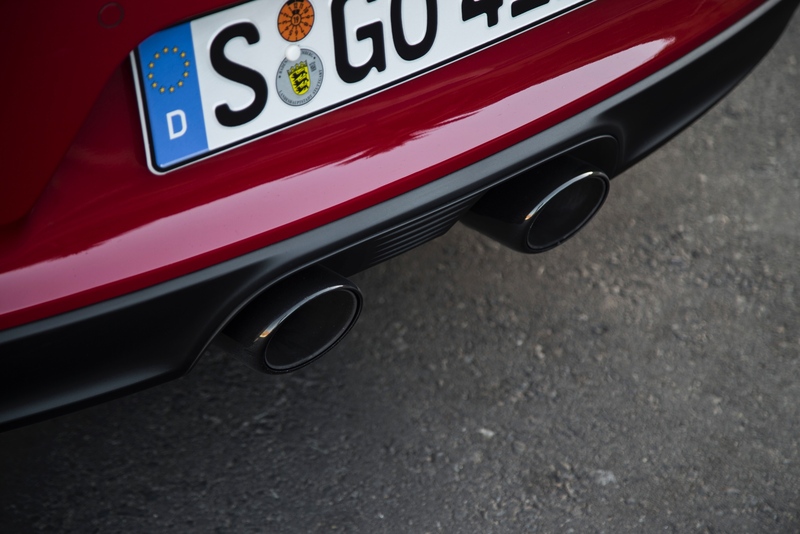 To round out all those definitive GTS touches is a sports exhaust system (as standard), creating a truly unique yet instantly identifiable symphony of exhaust notes. Producing what can only be described as a “blissfully throaty growl”, the engine sound exits the exhaust system with such power that it is impossible not to sit up and take notice. When Sport or Sport-Plus modes are engaged the automatic throttle-blip function is active, further enhancing that iconic 911 sound. Thanks to reduced sound-absorption in the pipes in combination with the perfect synthesis of engine and exhaust flap-control, that growl that we all know and love becomes other-dimensional. 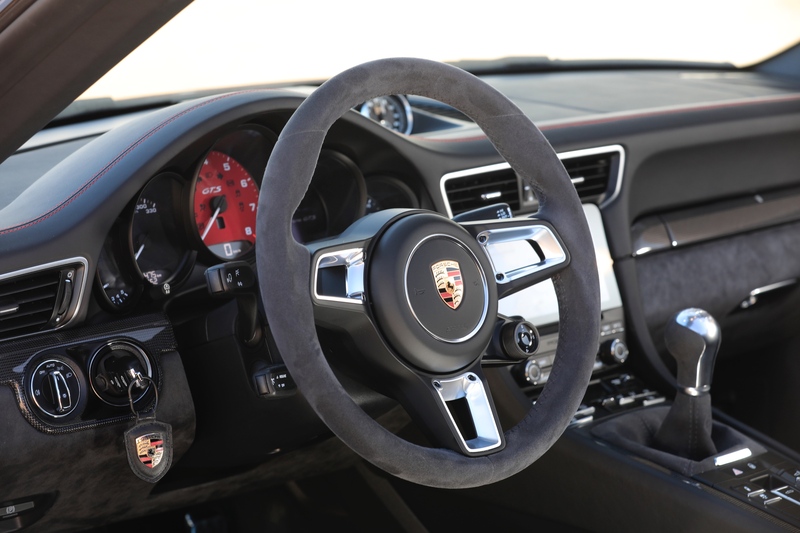 As you would expect from Porsche’s styling department, Alcantara makes a frequent yet perfectly balanced appearance within the interior: Steering wheel rim, centre console and armrest are all trimmed in the luxurious textile. The sports seats capture a true sporting ambience having also been trimmed in Alcantara and featuring a new stitching pattern, making them instantly recognizable as a performance model. Another favoured material in the GTS interior is brushed aluminium with a black anodized finish: appearing on all interior trim strips and really rounding out the “racecar” feel. Customers also have the option to have their rear seats removed in Coupé models to further reduce weight for track and efficiency purposes. Of course, a GTS wouldn’t be a true example without a few subtle GTS logos sprinkled about the place, now would it? These styling accents can be found embossed into the door sill guards, in addition to on the tachometer and the headrests. 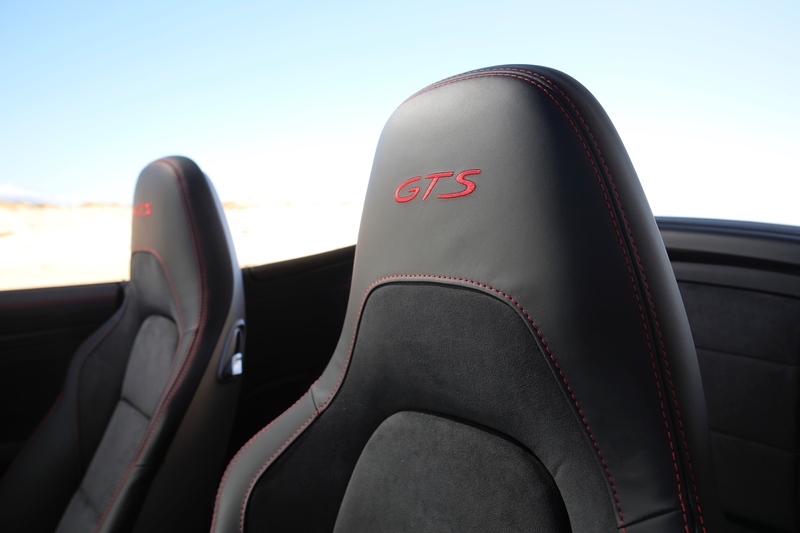 Where coupés have had their rear seats removed: the GTS logo can also be found on the centre-tunnel carpet. For those looking to go “full racecar” there is also an interior package on offer which includes contrasting stitching on seats, floor mats and headrests in an iconic shade of Carmine Red or Rhodium Silver, with seatbelts & rev counter to match. As a finishing touch, this package also includes carbon trim strips for a true track-ready feel. Porsche’s Sport Chrono package extends beyond performance gains, adding fine touches to this already-incredible design: an analogue timepiece set into the dashboard, a digital stopwatch in the instrument cluster and a performance display within the infotainment module are just a couple of the additional features. 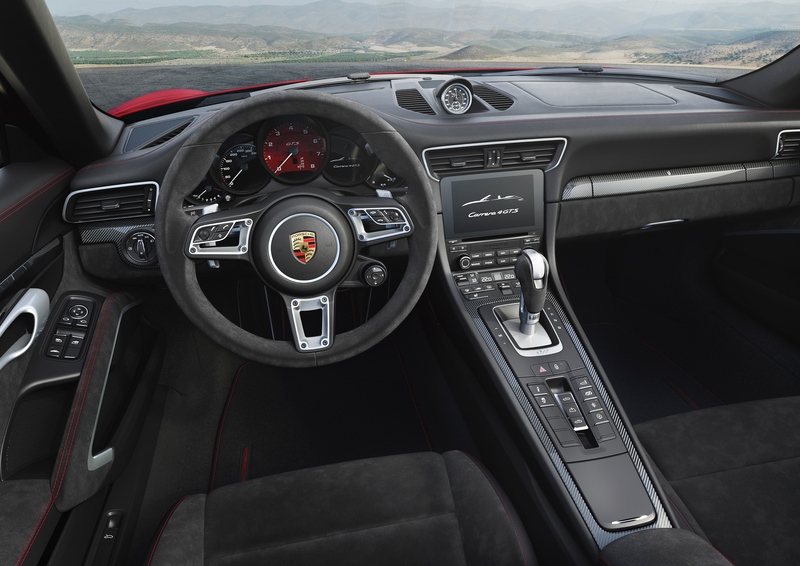 Finishing off an engaging and balanced cockpit is the Porsche Communication Management (PCM) system with touchscreen, real-time traffic information, dynamic route adjustment, and smartphone pairing for additional controls. 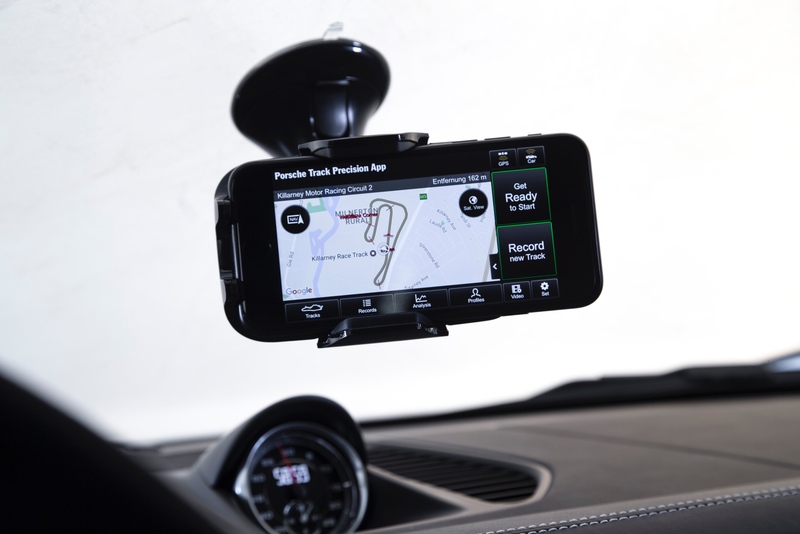 The new Porsche Track Precision app is also a standard feature in all variants of the GTS for the first time; this app allows track-oriented customers to automatically record their escapades while racing whilst logging and analyzing data in real time and showing a detailed display for the driver’s benefit. More an overview of Porsche Connect services available in your country & model, go to www.porsche.com/connect.